German Tosafist and liturgical poet; flourished at the end of the twelfth century and the beginning of the thirteenth. He was rabbi of Münzenberg, Hesse. His mother was a daughter of Kalonymus the Elder of Speyer, and his teacher was his granduncle Samuel ha-Ḥasid, also of Speyer. He is quoted in the Tosafot and in the Talmudic works of his pupil Simson of Sens (Commentary to Sifra, 34a and 53a), of Mordecai ben Hillel. (Ket. ii. 2; 'Ab. 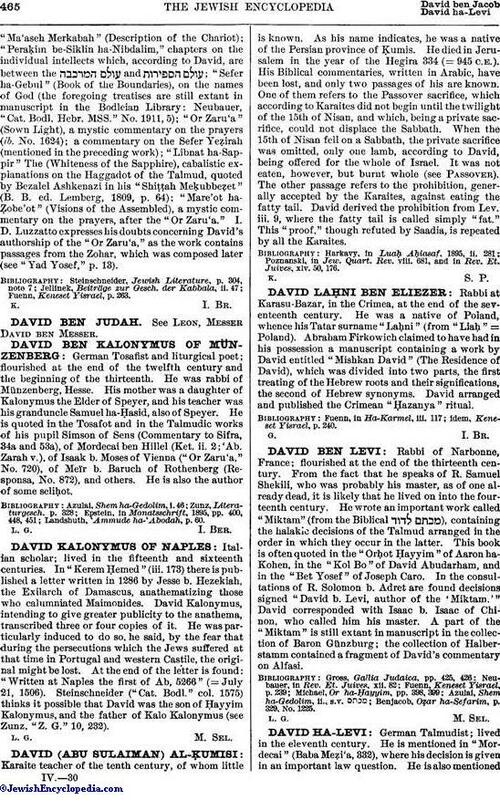 Zarah v.), of Isaak b. Moses of Vienna ("Or Zaru'a," No. 720), of MeÏr b. Baruch of Rothenberg (Responsa, No. 872), and others. He is also the author of some seliḥot. Landshuth, Ammude ha-'Abodah, p. 60.